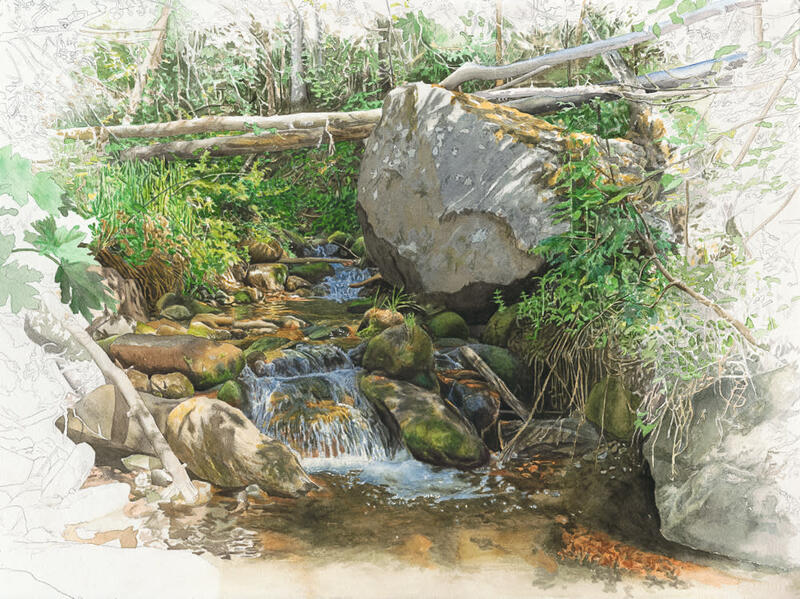 (37" x 57" Watercolor On Paper) This is a lovely area on the back side of Mt. Tamalpais in Marin County in California. I was hiking very early in the morning and found this on the banks of Cataract Creek near Laurel Dell. The morning fog hadn’t cleared yet, and shrouded the distant trees in fog. 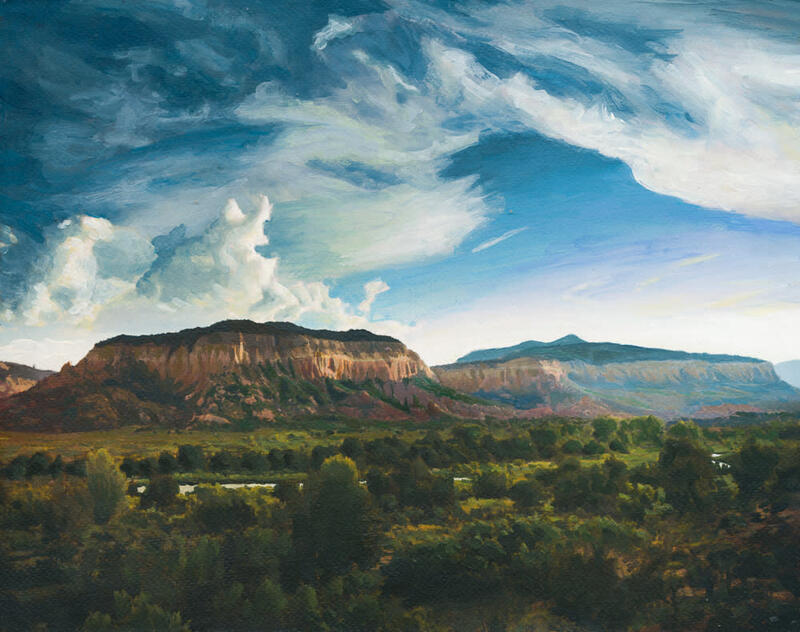 (37" x 43" Watercolor On Paper) This is looking south in late afternoon in the Chama River Canyon near Ghost Ranch in late summer. It’s a really beautiful place, and I didn’t see a single human being this day. I love the rich quiet beauty here. 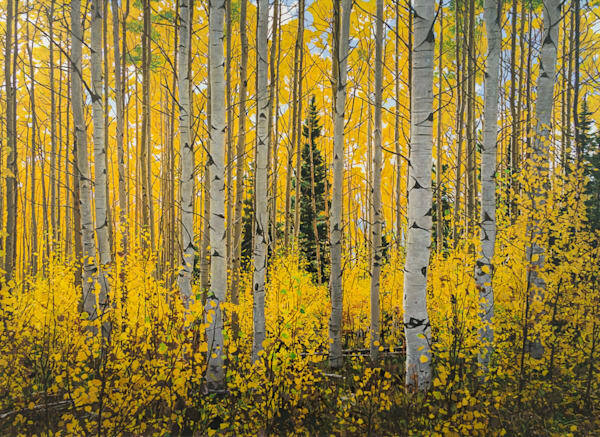 (18" x 24" Acrylic On Board) This is from a hike up in the Aspens in the Sangre De Christo range above Santa Fe in high fall. 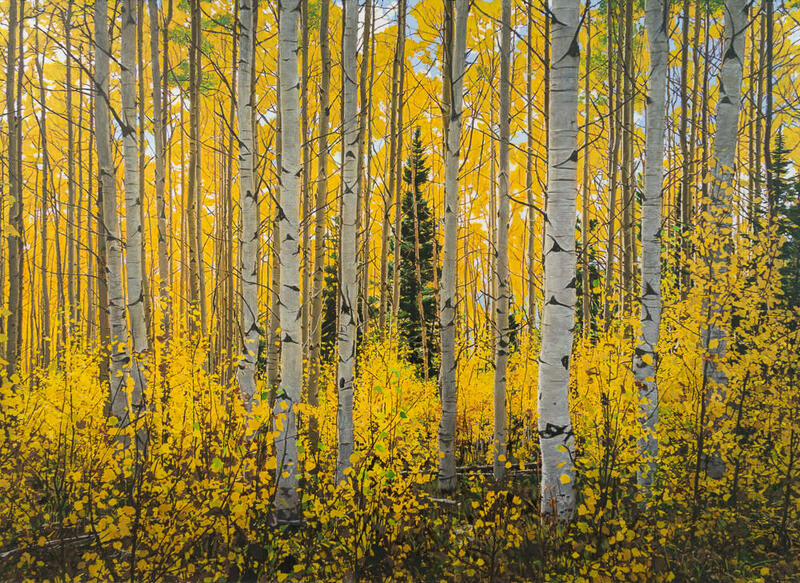 It’s almost hallucinatory to be surrounded by this intense yellow everywhere. I hadn’t dared to attempt this in watercolor, so was more willing to attempt it in acrylics. 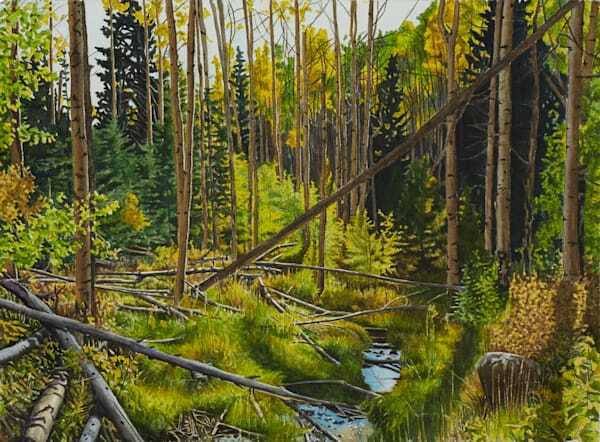 (22" x 30" Watercolor On Paper) This is a little trail heading down from the ski area at Santa Fe in the Sangre de Christo mountains. 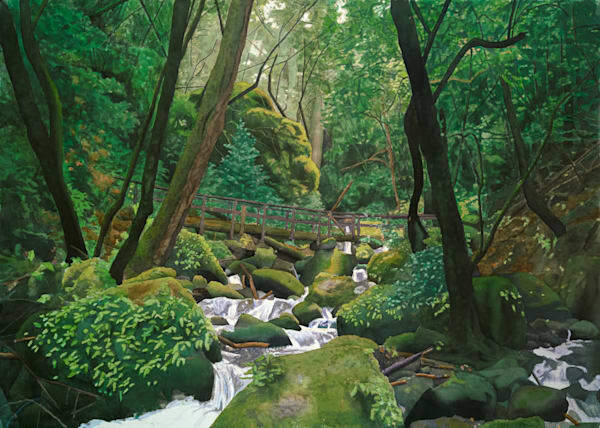 It follows the stream called Rio en Medio, eventually down to the village with the same name. 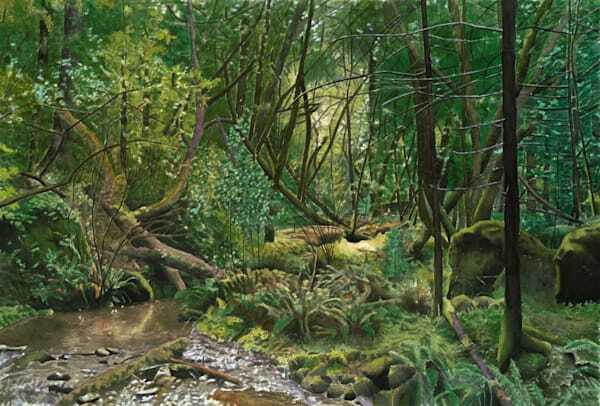 This is a little pool just off the trail. 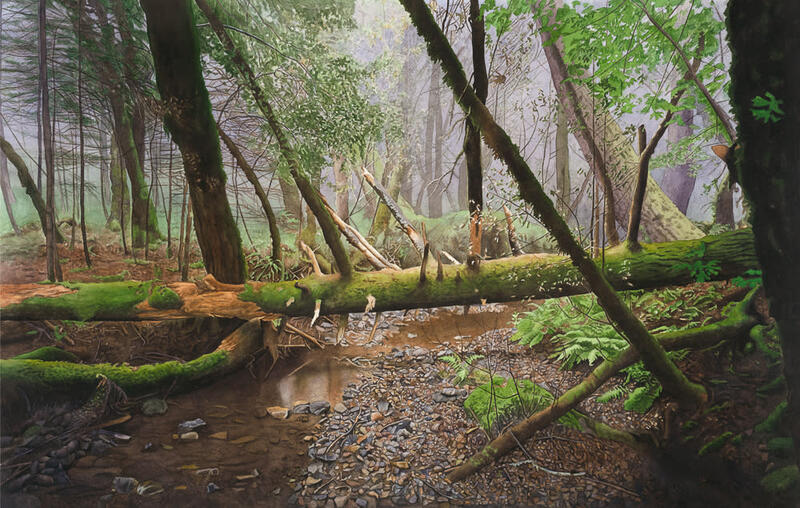 In this painting, I am playing with the idea of leaving the edges unfinished, a little like the way we perceive the world I think. 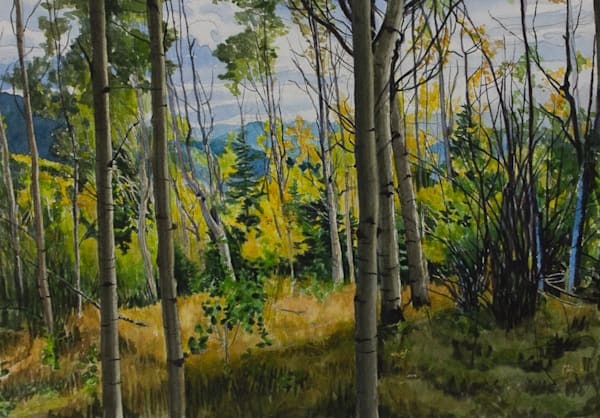 (22" x 30" Watercolor On Paper) This is another painting from the little trail heading down from the ski area at Santa Fe in the Sangre de Christo mountains. 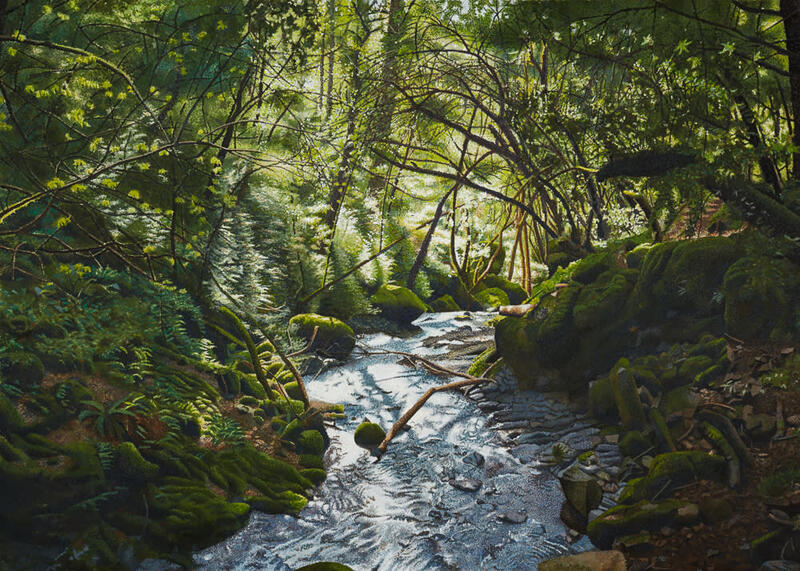 It follows the stream called Rio en Medio, eventually down to the village with the same name. 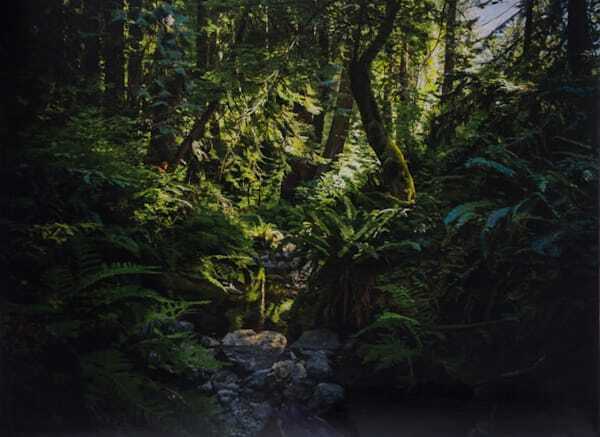 This is a little pool just off the trail. 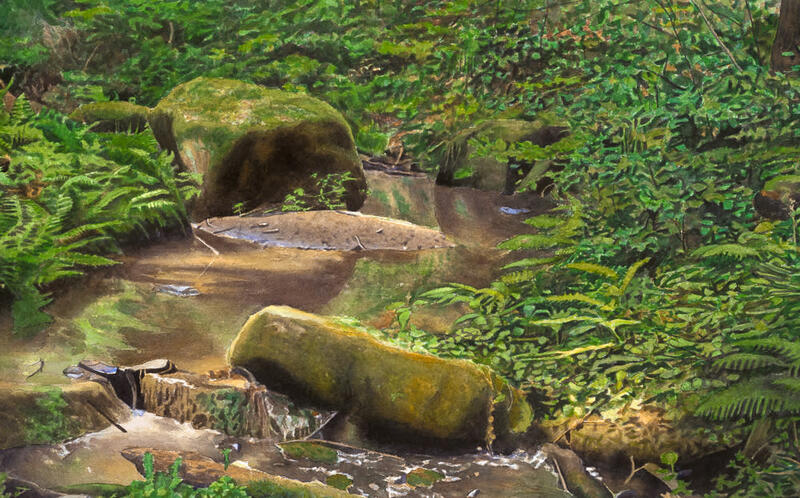 In this painting, I am playing with the idea of leaving the edges unfinished, a little like the way we perceive the world I think. (13" x 13" Acrylic On Board) This is from a very early morning hike along the Las Conchas trail in the Jemez Wilderness, It’s a beautiful hike that follows the east fork of the Jemez River through a valley surrounded by volcanic rocks. (29" x 57" Watercolor On Paper) This is from my first trip to the Chama River Canyon in early November. The sun was just going down as it illuminated the river and the cliffs in the distance. I go back here all the time; it’s a magical and usually empty area. 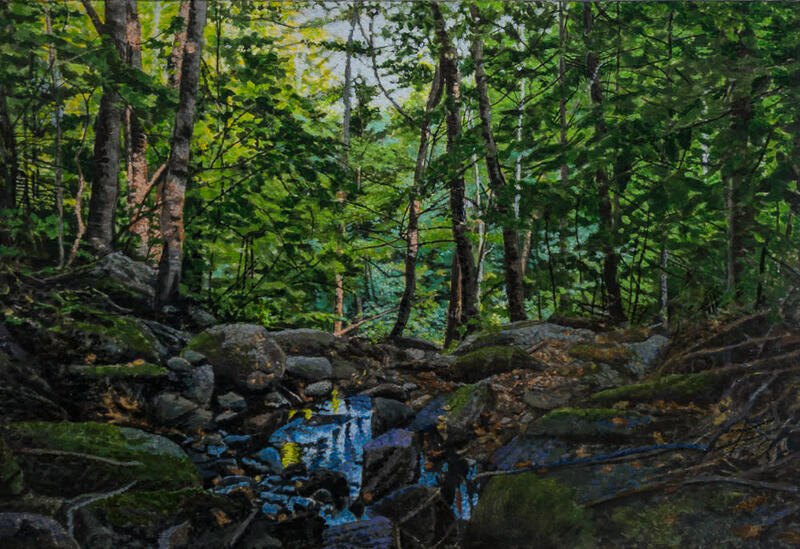 (12" x 18" Acrylic On Board) This scene is from an early morning hike up the Steep Ravine trail. I had already moved to Santa Fe and was working occasionally in San Francisco, and was pretty overpowered by how beautiful these forests can be. 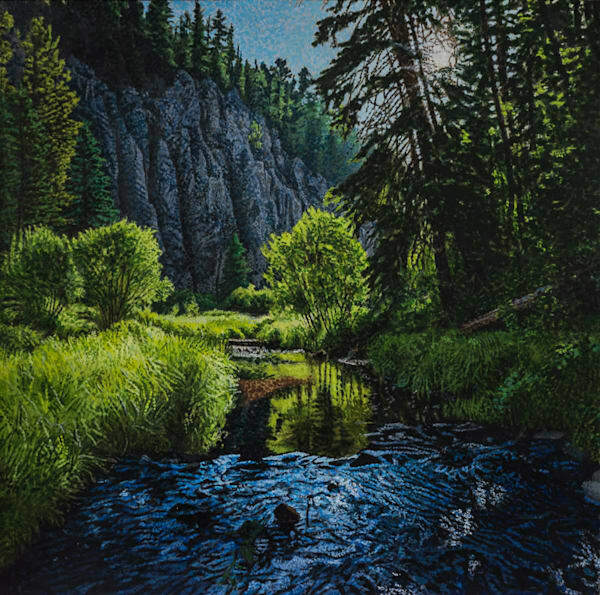 (11" x 14" Acrylic On Board) I visited the Wild River area north of Taos in winter and spent the night in a friend’s SUV so I could get up at dawn and hike down into the two canyons; where the Red River and the Rio Grande meet. This is looking up the Red River Canyon a few hundred yards before it joins the Rio Grande. (42" x 55" Gouache On Paper) I lived in Fairfax for many years, and spent a great deal of my weekends hiking the back side of Mt. Tamalpais. 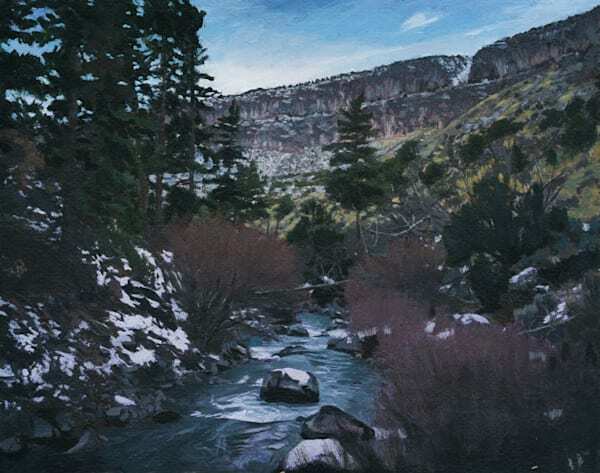 One of my favorite hikes was around Cataract Creek above Alpine Lake. This is the view from the bridge crossing the creek, looking out over the falls. (11' x 14" Acrylic On Board) I spent many years living and working in the San Francisco bay area. 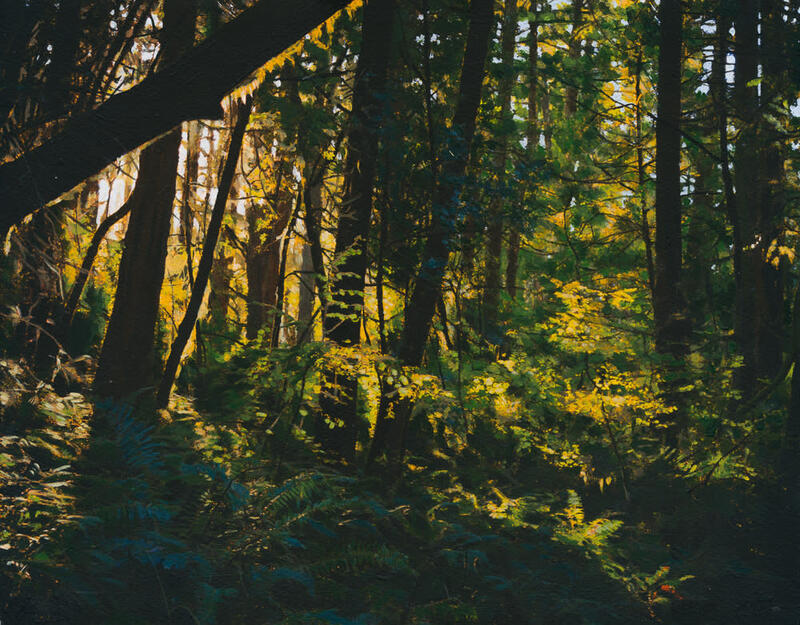 This is from a dawn mountain bike excursion into the forest in the coast range at Point Reyes. Just as I came to this spot the sun came over the ridge and hit the pine and bay laurel forest. 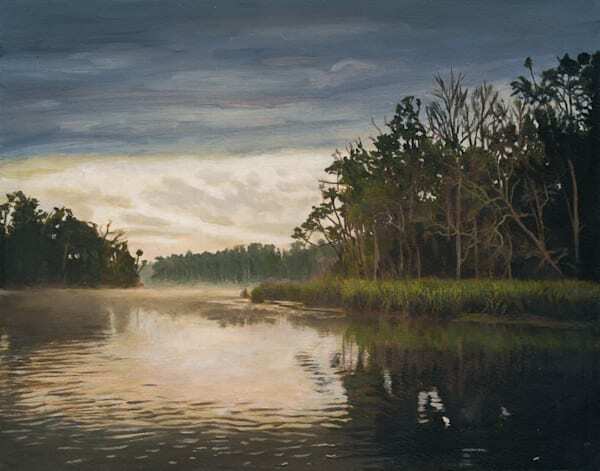 (11" x 14" Acrylic On Board) This is a spring fed creek that feeds into the Chassahowitzka River in Florida, very early in morning. This is looking east just as the sun is rising. In the early morning (this was just after six am) it feels as close to Eden as anything I can imagine. Birds are all over the place, and no humans are around. 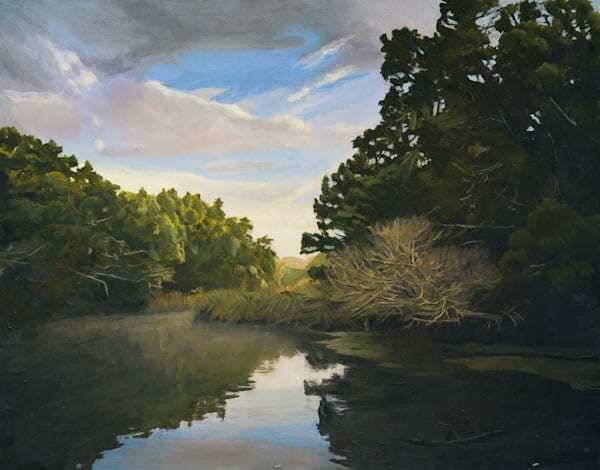 (11' x 14" Acrylic On Board) I have a childhood friend who lives a hermit’s life on this beautiful and generally unknown spring fed river on Florida’s west coast. It’s like going back 100 years or more. 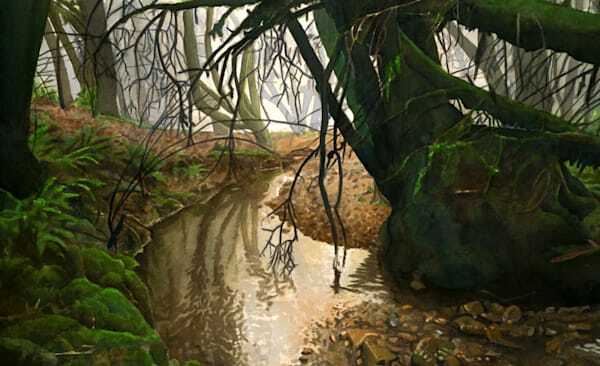 In the winter, because the air is colder in the early morning than the water, steam covers the river. 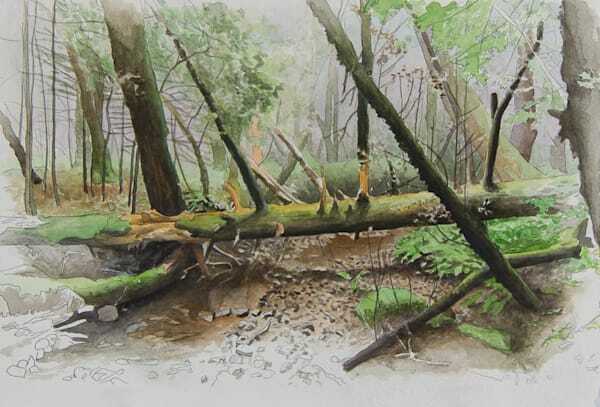 (40" x 60" Watercolor On Paper) This is from an afternoon ramble in the redwood forest near Santa Crus across from the university, in what is now Wilder Ranch State Park. For may years, this painting hung in the offices where I worked to remind me that I wanted to be an artist again someday. 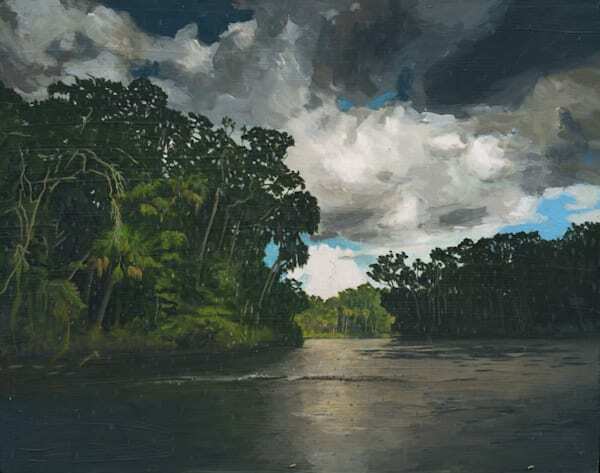 (11" x 14" Acrylic On Board) Rain was pouring onto me and my cheap waterproof camera as I took this photograph on the Chassahowitzka River in Florida in the summer, just as a mullet jumped in front of me. I grew up in Florida and kind of hated it once I was old enough to know what was going on, but this area is lost in time and is really special. (11" x 14" Acrylic On Board) This is looking across the river in the Chama River Canyon near Ghost Ranch in late afternoon. It’s a magical place, and I go back often. I rarely encounter any other people there. 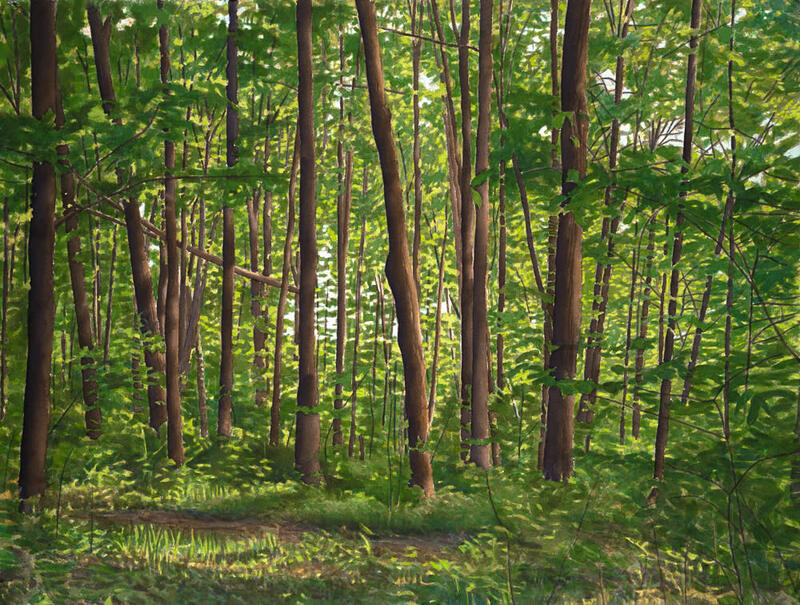 (9" x 13" Acrylic On Board) This a forest in Vermont just above the Quaker boy’s camp where I worked many years ago. I went back for a reunion and saw this scene as the sun was setting. 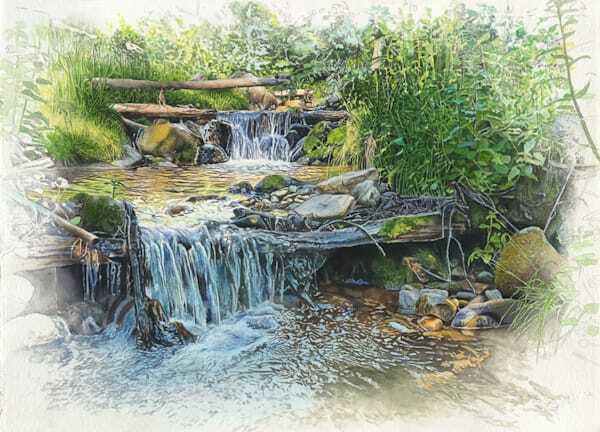 This started out life as a (rather insipid) watercolor. I then glued it to a board and painted over it to bring it back to life. (19" x 24" Watercolor On Paper) This is from an early morning wander up on Mt. Tamalpais. The coastal fog hadn’t cleared yet, and I loved the feeling of this creek bank with the bay laurels going off in the distance. 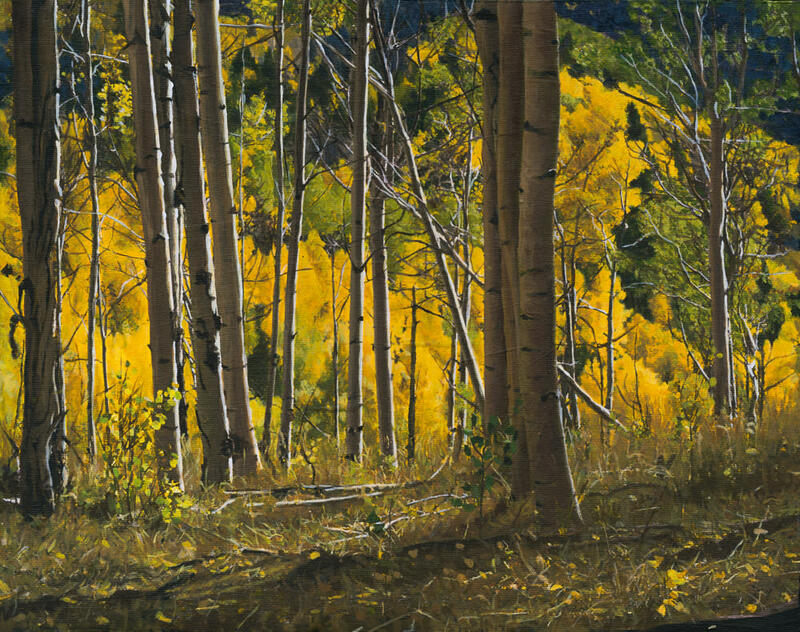 (11" x 14" Acrylic On Board) This is looking down from the Alamos Vista Trail in the Sangre De Christo Mountains in early fall. 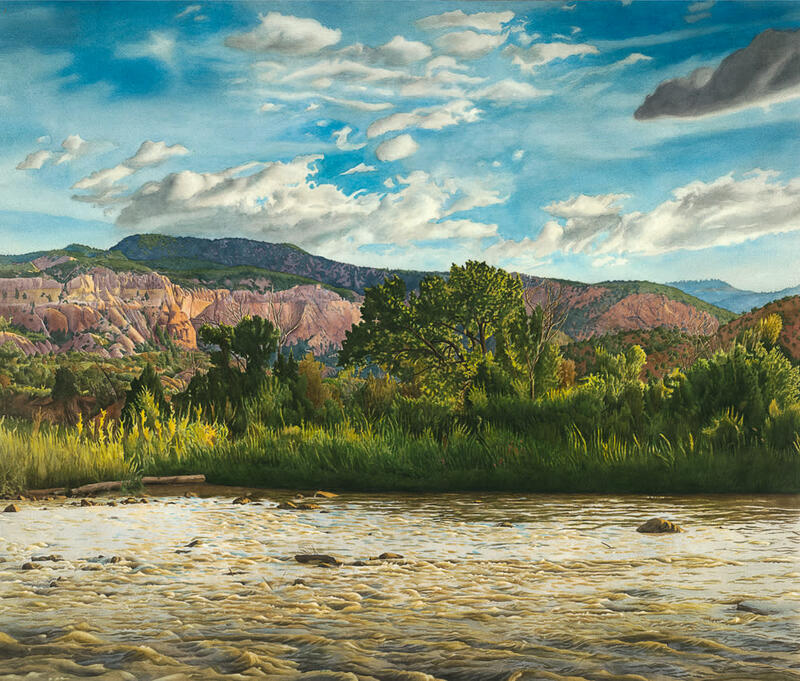 (18" x 38" Watercolor On Paper) This is looking at the Brazos Cliffs from highway 64 above them on a rainy summer afternoon. I love the feel of grandeur and the lushness of the mountains up there. (11" x 14 1/2" Watercolor On Paper) This is a study for a larger watercolor of the little stream called Rio en Medio. 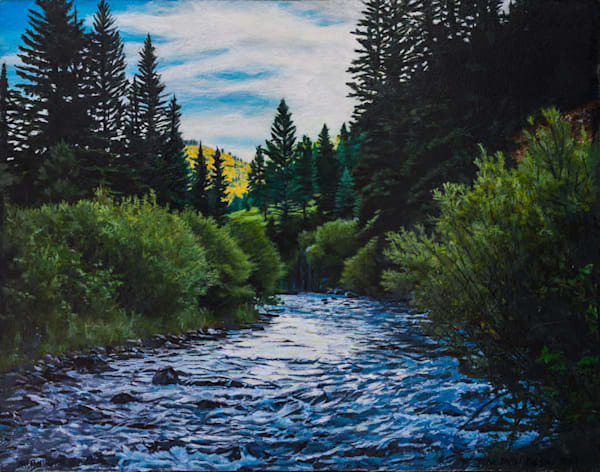 The trail of the same name starts from the ski basin above Santa Fe. It’s a lovely little trail, but since one travels downhill first, one gets sucked into traveling pretty far and then having to climb steeply back up. 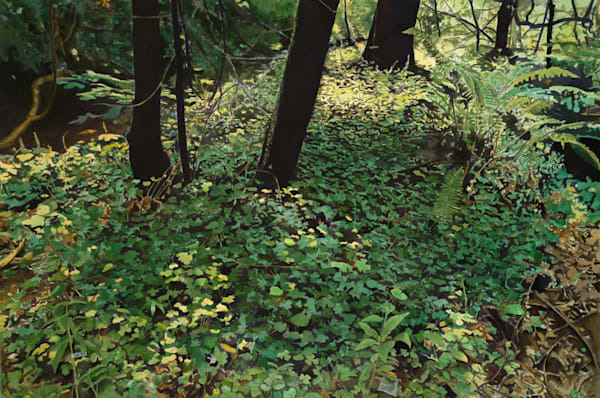 (36' x 51" Gouache On Board) I spent many years hiking all around the back side of Mt. Tamalpais. This is from a late afternoon looking down onto Cataract Creek. It began life as a watercolor and then evolved, as many a failed watercolor does, into a pointillist gouache, which I then mounted to a panel. 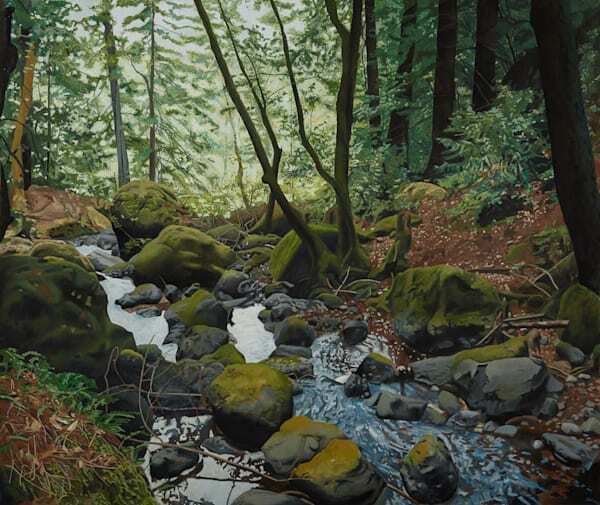 (29" x 41" Watercolor On Paper) One of the first trails I discovered when I moved to Marin county was the Cataract Trail up from Alpine Lake. This is the view from the top of the first section looking towards the bridge over the creek. (22" x 30" Watercolor On Paper) This is early morning in a lovely little glade on the north side of Mt. Tamalpais in Marin County. )9 1/2" x 14" Watercolor On Paper) Looking out in early spring from trail above Santa Fe in the Sangre De Christo Mountains. 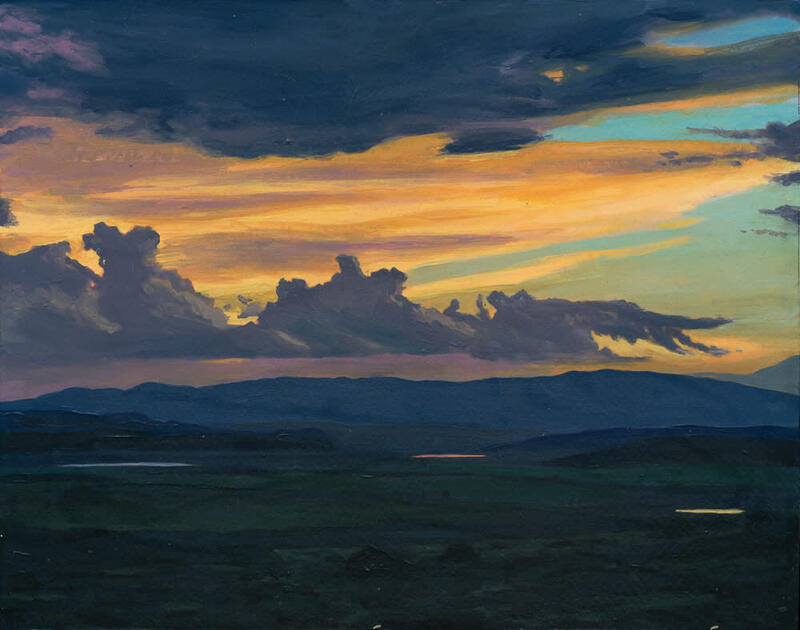 (11" x 14" Acrylic On Board) This is from near Chama in northern New Mexico coming back from Colorado as the sun set. I pulled off the road and just stood here for the longest time. It was very quiet and not a soul around. 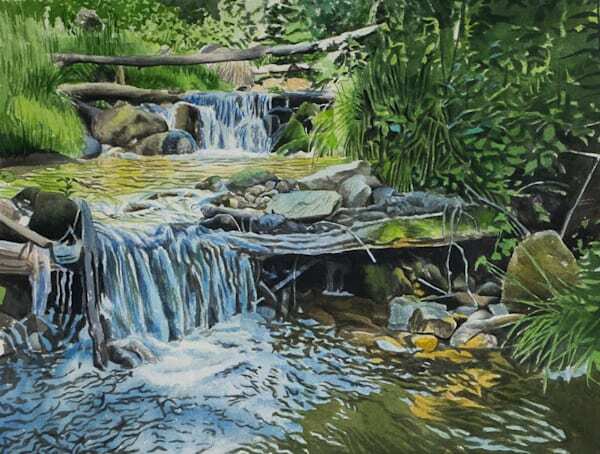 (9 " x 13" Watercolor On Paper) This is a study for a very large watercolor. I wanted to get some idea of what I was getting into before I started on the full painting. I was able to work more loosely here because of the permission that doing a study gives, and also played a little with not finishing the painting to the edge. 16" x 29" Watercolor On Paper) I had some down time from a film shoot outside of Prague and found this little creek in the forest near where we were shooting.